The term "liquid sunshine" has been around for a long time. Aloha Swap Meet and Duke's Alley, two tourist shopping meccas on Oahu, used to sell mini raincoats the size of a travel pack of kleenex called "Liquid Sunshine." (Or that's how I remember it!) The raincoats were flimsy and offered hardly any protection against a good rain shower, but they were still popular items. Liquid Sunshine is another word for rain in Hawaii. hard to tell in this pic that it's raining! I've heard the term used jokingly, for a heavy rain on an overcast day. More commonly, liquid sunshine is a light rain in which the sun peeks in and out of the clouds. It's raining but also "sunning" at the same time. Sometimes the sunlight disappears quickly, but it's a magical moment, when the sun appears through the overcast sky as the rain is falling down. 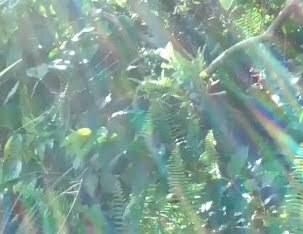 I've been trying to capture liquid sunshine on video for a while now and my best effort so far is this very short bit of liquid sunshine in a pineapple patch. Specifically this pineapple patch is at Onipa'a Sustainability Center in Huelo. Today is another overcast day in upcountry Maui. Or at least in Haiku. But it always rains in Haiku, doesn't it? Even if it's sunny in Haiku, that's just an illusion. Actually, I did hear that Wailea and Makena, on the other side of the island, were overcast yesterday as well.